It’s been 5 solid years (from October 2012 to October 2017) since they first arrived in Beijing. They are leaving the city just at the right time, neither too early nor too late, with no hesitation, no specific reasons, they are beginning a new chapter, being Jiangnan women. “That’s how life is sometimes. Decisions ain’t so hard to make when you listen to your heart, when the time is right.” said they. I can’t tell one’s name from another, two girls who stick together like they are joined at the hip. One day, all of a sudden, they decided to go to Southern China. As their close friend in Beijing, I’m having mixed feelings. I hate to part with my two lovely friends. I also understand their desire to pursue a free and easy lifestyle. Cece is the girl I know, who more often post selfies, comfortable with showing bits of her life online, but she still makes it feel like it’s not too much. She is a positive girl, living her life like in some novel or poem. She loves art shows, stage plays, reciting poetry. She is currently a freelance writer, having a cat, often stays up all night for a manuscript. Every time I see her, she is always cheerful and smiling, talking about how her cat Garfield flirted with some other cats. She appreciates summer days, raining nights and is an animal lover. She is one of the most caring people I know. I often think that she must has been a philosophical poet in her last lifetime. Previously, she worked for a fashion Internet company. One day with no hesitation, she just gave up her job and decided to be a fashion buyer. She flies out of China at least 3 times a year. Besides she loves to travel and she tries to leave her footprints across the world. It’s normal for her to go on a trip without planning. I remember clearly, one day she just told me: “ I am hiking in France in 2 days and I will come back in 10.” She asked for a leave and left me all confused. Since she travels around the world, we made an agreement: she brings back a local fridge magnet wherever she travels to. Now her fridge is covered with numerous magnets from all over the world. Honestly, I doubt I can accept being apart from them. We maybe will only be able to meet once a year. That means nowhere to go to bum meals, no friends to stay up all night with for movies, nobody coming with cakes to celebrate my birthday. Nowadays people often console each other and say: It only takes a few hours to meet up by high-speed train. But that can’t measure up with simply meeting whenever you want. They are running towards their new life with a light heart. However, I know what is the hardest for them, leave behind their sweet comfy Hutong house where filled with memories and recollections of Beijing. The fun of friends coming over, the laughter. Their fascination of Hutongs started on their 10-years contract with their landlord. The cozy quadrangle is situated on the Old Gulou Street, in the heart of Beijing Hutong areas. Easy access to Gulou, Nanluoguxiang, and Lama Temple on foot. Although the location seems perfect, yet I can’t forget the worn-out scene when I first saw the house: the madly peeling walls, nothing there except a low-priced white-colored bed. Cluttered courtyard, fallen leaves all over the floor. It was hard for me back then to understand how come they dared to sign a 10-year long contract! They painted the walls, floored the rooms, carefully selected the furniture, handcrafted ornaments, they deeply thought about every little details, all done by themselves. They jokingly called themselves “Super Peasant Girl Labourers” . After a few months, we finally received their housewarming invitation which gave us a shock. We praised them again and again. I saw from their faces that they were also pleased with themselves. I admired their superb skills. Who can say “you can’t enjoy a rented house as your own home?”! When all their friends me included were saving troubles by just renting a Ziru room, the two of them were creating their own sweet cozy “nest”. They love life for beauty’s sake, but don’t follow the same pattern. They say Hutong houses are the real home of Beijing. Arranging a home is just like making friends, can find the doctrine of rubbing along after accommodating each other carefully over time. I was on the sofa carefully examining every corner of their home, a warm and peaceful feeling filled my heart. I was so relaxed, the entire afternoon just passed quickly and quietly. They placed a sofa, a projector, some plants in the living room after repainting the madly peeling walls. Now it’s a place where you wouldn’t feel bored even if you spend an entire day here chilling. It’s where you can appreciate a cup of tea, where you can lie down leisurely for a movie. Xixi’s room is simple but comfy. The tapestry hanging on the wall was knitted by her, done overnight. “The tapestry is as free as me.” She smiled and said. The colors of the sofa and curtain were carefully selected and matched. You have a feeling of ease when looking at them. In a sunny morning, the brilliant sunshine streams into the bedrooms, birds twittering, mixing with the fresh morning air, a nice day is ahead of you. The recently-read books placed on the writing desk; circles on the calendar reminding her of the next traveling dates. Cece’s room is just as simple. She is an animal lover. The wall light is not only a light but also where she can place some small objects. She beautified and made full use of the space. The sofa area is her favorite place. Her books are piled neatly. She is determined to become an positive moneymaking girl, often spends all afternoon on the sofa reading. This room was a spare bedroom. They took a friend in once in a while. They thought they might as well decorate it. Then they attracted more and more people, some stayed for a week or two, some stayed for months. So far, they have accommodated many people in the room, took them for tours in Hutongs, invited them for dinners on their terrace, made friends across the world. It has become one of the many perks of living here. This terrace is a piece of fertile land they opened up on the rooftop. It’s a place you don’t want to miss out when the weather is right and where our gathering parties take place. 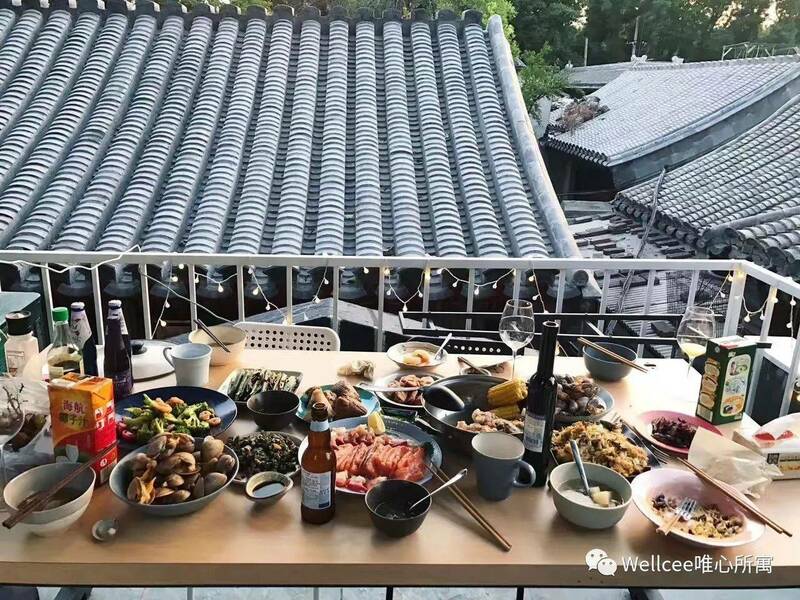 I think it’s the most appealing Hutong facet, enjoying the gentle breeze, a nice dinner, a glass toasting and friends, what could be better? After a few times giving the same menu, this conversation is no longer repeated. No matter how spoiled I am with food, they never get tired. Furthermore, there is always an extra surprising dish prepared. The courtyard has become a good spot for sunbath after being fixed up. The little bar in the courtyard is also perfect for relaxing. That’s the story about Cece, Xixi, and their cozy Hutong home. I, as their friend, got used to being looked after by them, being a freeloader here, I now have to learn how to stand on my own feet without them. Honestly, I am happy for them. Everyone has their way of living, it’s a courageous remarkable move they are making. It is destiny we have met. I wish we could all live our lives the way we like.